Reentering the community after incarceration is daunting. Imagine being locked up for days, weeks, months or years knowing the stigma society attaches to it. Often, incarcerated individuals are unemployed with drug or mental health issues. They often have no family support and no housing, money or even photo identification when they get out. They may have no idea where to start to get back on their feet. As part of our evolving and open philosophy to new strategies to ensure the success of inmates, we are concentrating fresh effort on this transition back into the community. This builds on our core responsibilities such as managing the Arlington County Detention Facility (ACDF) and overseeing Arlington’s courthouse/courtroom security (Juvenile, Domestic Relations, County, Circuit and General District courts)/civil process service. Through 18 years serving as Sheriff for Arlington County, my staff and I have continually looked for better ways to securely serve Arlington’s 230,000 residents and to effectively manage and prepare the inmates for life after incarceration. One example is the new Community Readiness Unit (CRU), established in May 2018. It focuses intensely on individualized reentry planning, work readiness and programming for substance abuse, mental health and life skills. The CRU builds on early work of the Arlington County Reentry Committee (ACRC), created in 2009 to ensure successful offender reentry, reduce recidivism and enhance public safety for Arlington residents. ACRC’s goal is to assist those incarcerated with supportive services — such as job training or mental health services — so that they may more easily transition from jail to the community and sustain a life that will not lead to repeat offenses. Some of the CRU’s programs may seem surprising, such as Fatherhood, Wellness, Money Management, or Peer Group and Cognitive Distortion Recognition. Yet such topics can be just as vital to a person’s successful transition as programs on Employability Readiness, Individual Re-Entry Planning or Addiction Awareness. All classes are conducted by Sheriff’s Office case managers, Arlington Department of Human Services (DHS) staff, Offender Aide and Restoration (OAR) staff and volunteers. Our hope is that everyone that reenters the community from the CRU will, like the inmate mentioned above, have a network system and the tools they need for success. The key is helping them identify and eliminate barriers before they get out. ACRC assists incarcerated individuals with a discharge plan focused on their needs, appropriate resources and referrals to enhance successful reentry to the community. Resources include ID cards, mental health and substance abuse services, shelter, and job placement. Our partners include DHS, OAR, the Public Defender’s Office, and the Adult Probation and Residential Program Center-Shelter. Inmates returning to the community face many challenges and those who have difficulty adjusting often re-offend. As the sheriff of Arlington County, I am committed to ensuring that individuals who are remanded into the custody of my office receive opportunities to “right” their wrongs and become successful citizens of our community. 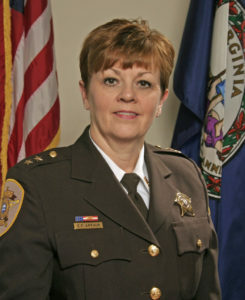 Sheriff Beth Arthur was first elected in 2000 and is the first woman elected to a County Sheriff’s position in Virginia. She has served more than 31 years with the Arlington Sheriff’s Office. She is a member of the Virginia Sheriff’s Association Board and served as its first female President from September 2012 through September 2013 and is a member of the Board of Regents for the Leadership Center of Excellence.